Every quarter, the StatCan Blog publishes a guest post on research at Statistics Canada. Our third post is from Mark Brown, a chief in the Economic Analysis Division, Statistics Canada. Trade costs have proven to have a significant effect on the degree and nature of economic integration across regions and countries. They can stem from multiple factors such as the need for marketing, tailoring products to meet regulatory requirements and transporting the goods themselves (Anderson and van Wincoop 2004). Some trade costs are associated with border effects—trade costs incurred when administrative boundaries are crossed. Border effects can include not only international border crossing tariffs but also non-tariff barriers (e.g., differences in regulations [Chaundy 2016]) that may increase the cost of trade across national and sub-national (e.g., provincial) borders. Trade costs are important because they influence the ability of firms to trade and access new markets and inputs at both the domestic and international levels. Moreover, the importance of measuring border-related trade costs looms even larger with the renegotiation of the North American Free Trade Agreement (NAFTA). Trade costs are also important because they affect the location and investment decisions of firms. Firms may choose to overcome trade costs by locating and producing in new markets (horizontal integration), or they may choose to take advantage of lower trade costs and relocate parts of the production process to take advantage of specific inputs or cost savings in a particular region (vertical integration). A previous Statistics Canada research blog post on trade and productivity described Canadian evidence on the productivity benefits of more openness to trade. This new blog entry describes the Economic Analysis Division's ongoing data development and research in this area. The division is working to estimate and unpack trade costs to provide a more detailed understanding of the barriers to trade and investment. The results will enable policymakers and firms to develop better mitigation strategies. Due to data limitations, measuring trade costs, particularly for domestic trade, has proven difficult. Over the past few years, Statistics Canada has been making strides to address this data gap by measuring trade flows and their associated costs across regions. For example, a new database that uses a set of truck and rail shipment records was created. It measures the value of regional trade in goods from 2004 to 2012 that were scaled to match known intraprovincial and interprovincial trade levels.Footnote 1 In addition to value, these new data measure distance shipped and transportation costs incurred. To date, an experimental regional trade database consisting of 30 greater economic regions has been released (CANSIM table 386-0004)Footnote 2 along with a set of interactive data visualization tools developed to explore the interconnectedness of regions in Canada. While data visualizations provide a way to understand the basic patterns of regional trade, they can also be used to see the effect of distance-related trade costs. The impact of distance can be seen when trade flows are mapped (see figures 1 and 2). Montréal's most important trading partners are the Québec and Toronto regions, while Edmonton has stronger links with other regions in Alberta and generally with western Canada, relative to Montréal.Footnote 3 However, teasing out the effect of trade costs on trade and the location decisions of firms means moving beyond maps and developing more in-depth analyses. The research agenda based on these data has several themes, including estimates of border-related trade costs, be they provincial borders or the Canada–U.S. border, and the implications of trade costs associated with how firms organize their production in terms of location and size that ultimately influence productivity. In Canada, one of the concerns of policymakers is how much trade costs, particularly border-related trade costs, dampen trade. An estimate of the effect of borders on trade rests on accounting for the cost of trading goods, which increases with distance between regions, as well as the capacity of the trading regions' economies to generate and absorb trade. After taking these factors into account, Bemrose, Brown and Tweedle (2017)Footnote 4 found that trade within provincial borders is 53% stronger than across provincial borders—a difference that would be expected if a 6.9% tariff were imposed on interprovincial trade. In the absence of border effects, regional trade within provinces and across provincial borders should be equal when other factors are taken into account. Building on this initial work, researchers at Statistics Canada are seeking to reveal what factors underlie provincial border effects. Are they affected by the degree to which provinces differ in terms of their regulations? Are firms less likely to extend their operations across borders because of regulatory differences? And, if so, does this account for provincial border effects since firms reduce trade costs through investment in their supply chains? Of course, the cost of trading across the Canada–U.S. border has long been a source of interest (McCallum 1995). Our initial work looked at how much more trucking firms charge to move goods across the border compared with domestic shipments in the wake of 9/11. The difference amounted to the equivalent of putting a 0.6% tariff on trade (Anderson and Brown 2012; Brown 2015). This work is being followed up with estimates of the Canada–U.S. border effect, which can be compared to provincial border effects. We ask how much Canada–U.S. trade would increase if the Canada–U.S. border effect were to fall to provincial levels and how much interprovincial trade would have to rise to compensate for a rise in the Canada–U.S. border effect. Contrary to the point of view that transport costs no longer matter (the world has become flat), such costs do affect firms' decision making. Using data on transport costs facing firms and information on the location of plants, we find strong evidence that rising transport costs cause firms to disperse geographically to serve far-flung markets at a lower cost (Behrens, Bougna and Brown 2015), but this effect is weakened when firms have strong input–output links (Behrens and Brown, forthcoming). Broadly speaking, the same is true of plant size. Baldwin and Brown (2008) showed that manufacturing plants that were closer to U.S. markets were the ones that adjusted the most (increased size and production run lengths) after trade barriers fell with the implementation of the Canada–U.S. trade agreement and NAFTA. Work is now being undertaken to measure how much access to domestic and U.S. markets influences plant size and plant-level productivity, tying the effect of trade costs—border effects and transport costs—and location to firm performance. 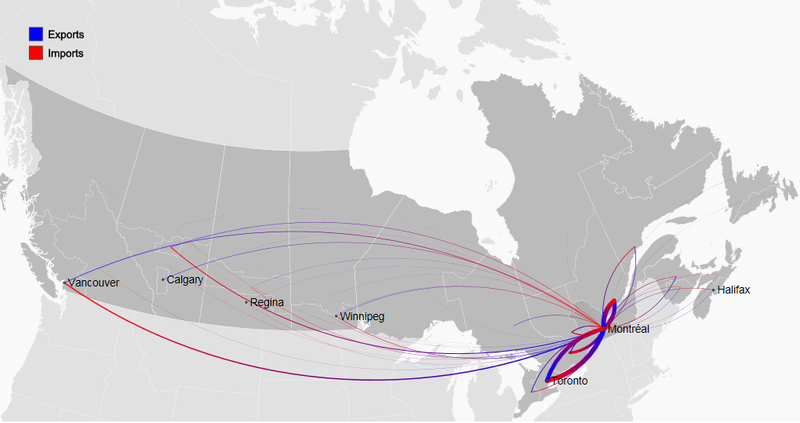 Figure 1 depicts the map of Canada and the trade flows between Montréal and other greater economic regions in Canada, including: Vancouver, Calgary, Regina, Winnipeg, Toronto and Halifax. The lines linking Montréal to Toronto are thicker, reflecting Montréal's greater intensity of trade with Toronto than with other cities. 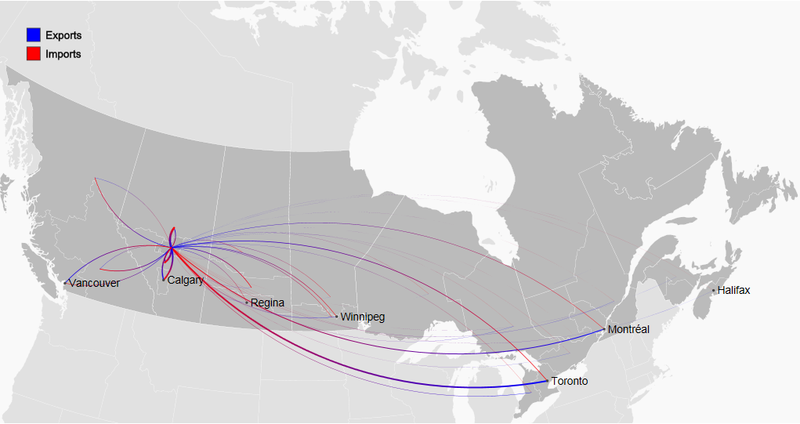 Figure 2 depicts the map of Canada and the trade flows between Edmonton and other greater economic regions in Canada, including: Vancouver, Calgary, Regina, Winnipeg, Toronto, Montréal and Halifax. The lines linking Edmonton to Calgary are a little thicker, reflecting Edmonton’s greater intensity of trade with Calgary than with other cities. Albrecht, L. and T. Tombe. 2016. "Internal trade, productivity and interconnected industries: A quantitative analysis." Canadian Journal of Economics / Revue canadienne d'économique 49 (1): 237–263. Agnosteva, D.E., J.E. Anderson and Y.V. Yotov. 2014. Intra-national trade costs: Measurement and aggregation. NBER Working Paper no. 19872. Cambridge, Massachusetts: National Bureau of Economic Research. Anderson, J.E. and E. van Wincoop. 2004. "Trade costs." Journal of Economic Literature 42 (3): 691–751. Anderson, W.P. and W.M. Brown. 2012. Trucking Across the Border: The Relative Cost of Cross-border and Domestic Trucking, 2004 to 2009. Economic Analysis Research Paper Series. No. 81. Statistics Canada Catalogue no. 11F0027M. Ottawa: Statistics Canada. Baldwin, J. R., W.M. Brown and Wulong Gu. 2008. Geographic Market Access and the Effects of Trade on Length of Production Run, Product Diversity and Plant Scale of Canadian Manufacturing Plants, 1974 to 1999. Economic Analysis Research Paper Series. No. 52. Statistics Canada Catalogue no. 11F0027M. Ottawa: Statistics Canada. Behrens, K., T. Bougna and W.M. Brown. 2015. The World Is Not Yet Flat: Transportation Costs Matter! CEPR Discussion Paper Series. No. 10356. London: Centre for Economic Performance. Behrens, K. and W.M. Brown. "Transport Costs, Trade and Geographic Concentration: Evidence from Canada." In Handbook of International Trade and Transportation, eds. B. Blonigen and W. Wilson. North Hampton: Edward Elgar Publishing Ltd. Forthcoming. Bemrose, R.K., W.M. Brown and J. Tweedle. 2017. Going the Distance: Estimating the Effect of Provincial Borders on Trade when Geography Matters. Analytical Studies Branch Research Paper Series. Statistics Canada Catalogue no. 11F0019M. Ottawa: Statistics Canada. Forthcoming. Brown, W.M. 2015. How Much Thicker Is the Canada–U.S. Border? The Cost of Crossing the Border by Truck in the Pre- and Post-9/11 Eras. Economic Analysis Research Paper Series. No. 99. Ottawa: Statistics Canada. Chaundy, D. 2016. Trade Barriers in Atlantic Canada: Opportunities for Regulatory Reform. Halifax: Atlantic Provinces Economic Council. McCallum, J. 1995. "National borders matter: Canada–US regional trade patterns." The American Economic Review 85 (3): 615–623. Goods trade excludes commodities moved by pipeline, like oil and gas. A much more detailed shipment-level file can be accessed through The Canadian Centre for Data Development and Economic Research (CDER). This is a general pattern that can be seen by selecting flows by region moving across the country—by "clicking" across the country—using the interactive map. This work complements previous efforts to measure (Agnosteva, Anderson and Yotov 2014) and assess the economic impact of provincial border effects (Albrecht and Tombe 2016).